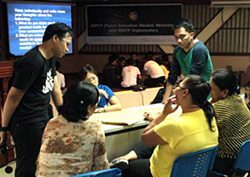 Twenty National Service Training Program (NSTP) implementers and 120 students attended the first university-level Peace Education Module Workshop on May 16 at Rizal Technological University in Mandaluyong City, Manila. The workshop presented the module contents while equipping implementers with effective classroom teaching methodologies and models of youth-led community service. The GPFF Peace Education Module was formally adopted by the Philippine Society of NSTP Educators and Implementers, Inc. (PSNEI) on June 2, 2011. PSNEI is responsible for the implementation of the National Service Training Program, which includes Peace Education as one of its eight components. Workshop sessions covered the three principal themes of the Peace Education Module: Our Common Identity: Conflict Resolution and Peace-building; Human Rights are Endowed to the People; and A Culture of Peace through Service. Dr. Ann Montejo-Arevalo, Curriculum Developer and Peace Educator of GPFF Philippines, gave presentations on three topics. Rizal Technological University’s newly appointed NSTP Director, Dr. Andres Delos Santos, thanked GPFF as a longtime supporter of student activities and for organizing the workshop to train the Peace Education implementers for the 2012-2013 academic year.